The image of the German Chancellor appeared in the course of a TV program about the migration crisis broadcast on Sunday on German TV channel ARD, leading to accusations of Islamophobia. 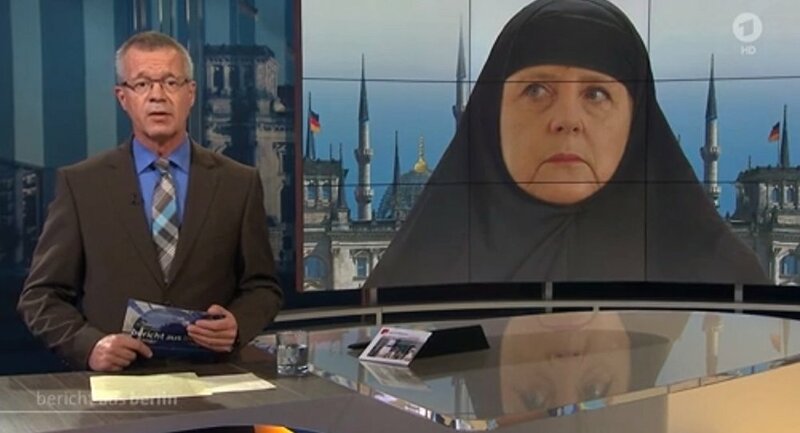 German TV channel ARD has come in for criticism of Islamophobia after its program Report from Berlin, [Bericht aus Berlin] depicted German Chancellor Angela Merkel wearing a veil. In the background of the image, the Reichstag was depicted with minarets. The image was shown in the course of a program on the topic of the migration crisis currently facing Europe, when the program's presenter Rainald Becker gave a rhetorical question about the effect that the influx of people will have on Germany, which is expected to receive up to 1.5 million migrants and refugees in 2015. "How is life going to change? How will we react if refugees have problems with gender equality, with women' rights, with press freedom and freedom of expression?" Becker asked viewers, standing in front of the image of Merkel wearing a veil. The producers of Report from Berlin responded to the criticism on Monday, on the program's Facebook page, claiming the image was a legitimate way of expressing the challenges being faced by German society. The broadcast of 'Bericht aus Berlin' showed the illustration at 1:30. "We are glad to hear the numerous criticisms of our illustration in yesterday's Report from Berlin, and very much regret that some disagreed with our representation of the Chancellor, or even misunderstood it." "The illustration was directly related to Rainald Becker's report about the values of our society. He was talking about the achievements of our Western society: freedom of expression, press freedom and equality. These freedoms are reflected in the form of the illustration." "Of course, it was also the aim of this artwork to gain attention and polarize. In our understanding of ourselves as journalists, we believe this form of pointed representation to be legitimate. We categorically reject any insinuation of Islamophobic propaganda."